— Psalm 105:1 O give thanks unto the Lord; call upon His name; make known His deeds among the people. 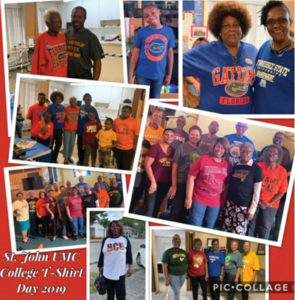 The members of St. John used their annual college t-shirt day as one means of displaying their thankfulness to God. The young and the used-to-be young proudly worshipped together wearing t-shirts from their favorite colleges and universities.